The Telegraph Media Group began embracing WordPress two and a half years ago: first its blogs were migrated over, then its My Telegraph community. They then began embracing WordPress people, hiring BuddyPress core developer Paul Gibbs, and hosting London WordPress meetups. Now they’ve gone a stage further: releasing a WordPress plugin in the company name. Expire User Passwords has obvious applications in a more corporate environment: it’s a zero-configuration plugin which you simply install and forget about. Until you reach the 30-day expiry point, when you’re prompted to renew your password. It’s available from the WordPress repository, where it’s owned by Paul and a new Telegraph user account. Or alternatively, they’ve just started making use of a Telegraph Github account which they seem to have registered two years ago. Well done, Team Tele. Great to see a large corporate giving back to the WordPress community. I’d love to know how they got over the inevitable concerns about plugin support, liability and so on. During the past few years the “live page” format has become a regular feature of our coverage around big breaking stories. The format has been a big success in terms of usage, so we’re thinking about what more we could do with it. We think the pages are not necessarily just about breaking news – they are also a real-time showcase of the best of what we (and others) are doing. A ‘breaking news blog’, in my book, should look and feel more like Twitter. Activate it when a huge story breaks – maybe only a couple of times a year, maybe a couple of times a month. Short snaps of maybe only a couple of lines, written in an informal tone. Pretend you’re MSN-ing a friend. Be prepared to be vague – read between the lines if necessary, and don’t be shy about getting it wrong. Stream of consciousness, if you like, and proud of it. I haven’t yet seen any news organisation doing this systematically… but if they have any business in breaking news, then they should be. I’ve also got an early idea for a ‘news jockey’ role, writing a running commentary on the day’s news blog-style. The USA Today thing is probably the closest comparison, but I’m thinking of something slightly different. It calls for a certain style of writing, and a certain style of writer, but I think it could be a winner. 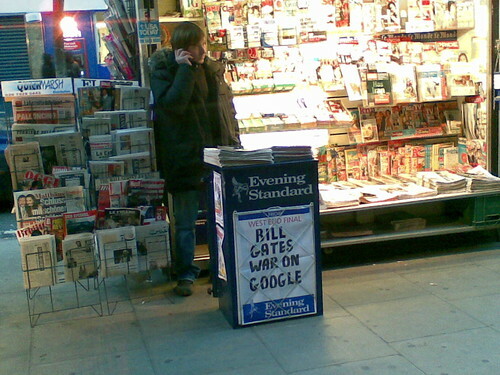 Anyway – one of the very few non-personal photos on my account is this one: a hastily-snapped shot of a news-stand outside Russell Square tube station, captured on nothing more advanced than a Nokia E65 phone. The Evening Standard’s report of a declaration of war seemed laughably over-the-top; and I was delighted to have captured the news-seller on his mobile phone, thus completing the trinity of media past, present and (not too distant) future. Anyway (again) – I discovered at the weekend that it had been lifted by a journalist at the Economist to illustrate an insightful piece on old media’s woes. No qualms there: I’d put a CC Attribution license on it, so I was more than happy for them to use it. And on some level, the story behind the picture makes it even more appropriate. On the very day that the Times puts up its paywall, the Guardian goes the complete opposite direction – and unveils a WordPress plugin intended to gets its content out there, on as many other people’s sites as possible, free of charge. Once you’ve installed the plugin, and signed up for an API key, you get effectively a subeditor’s view of the Guardian’s archives. If you find a story you like, and want to republish, you save it down to your own WordPress installation, then edit and publish it as normal. It even checks stories for updates. Much neater than a DIY solution based on something like the FeedWordPress plugin, and without the potential for licensing headaches… as long as you’re happy enough to leave the credits and adverts in place. The blogger (or whoever) gets free, simplified access to the Guardian’s content, without licensing worries; the Guardian gets additional attention for its material, a wider spread of advertising impressions, and a PR victory over its Murdoch rivals. If it sounds like something you’d be interested in, you can download it from WordPress.org. Just to note that the Independent has switched its blogs from Livejournal to WordPress. Why? According to online editor Martin King, there was a simple reason for the move: ‘to make them better.’ Clearly a man after my own heart. I must admit, I always had my suspicions that the Independent’s former arrangement with LiveJournal was driven primarily by the personalities involved, former Downing St colleagues Ben Wegg Prosser and Jimmy Leach (now back in Whitehall, of course). Worth mentioning too that the Telegraph has gone deeper into WordPress just recently, with the migration of its My Telegraph user community. Its blogs.telegraph.co.uk site, for journalists and commentators, moved over to WP about a year ago. The low graphics version of the site was designed as a low bandwidth alternative to the full website at a time when most users of the site were using slow dial-up connections. Now, most of our users are on much faster broadband connections and as a result, the percentage of users of this service has steadily declined to a current level around 2%. Fair enough I suppose. Except that I was one of those 2% of users. Why? – because I had it set to load in a Firefox sidebar. With one click of a browser button, I got my instant news fix. I use it constantly throughout the day. For obvious reasons, the full-size homepage doesn’t render especially well in a 200px-wide space; but the low-graphics version did pretty well. Not perfect, but pretty good. It’s a fairly simple PHP/RSS thing, with a dash of jQuery thrown in. I fetch the BBC’s homepage RSS feed via SimplePie, dress it up all pretty, then run a very quick jQuery routine to ‘zebra stripe’ the stories for easier reading. For each story, I give myself the headline, timestamp, summary – and the thumbnail image, something the low-graphic version couldn’t give (beyond the top three items). Why am I telling you this? Because it’s a perfect case study for the ‘raw data now’ concept. The BBC supplies the data, I bang out a hasty rendering routine based on free code… and I’ve got the service I want, regardless of what they want to do themselves. It’s running in my development web space; I’ve got no intention of making it public. But if you really think it would be useful for you, let me know, and I’ll maybe share the address details. There’s a fascinating (and lengthy) post on the BBC’s internet blog, setting the scene for a forthcoming ‘post-2.0’ redesign of its web presence. It’s a design geek’s paradise – global visual languages, grid systems, typography and colour palettes. Intriguingly, they start their potted history of the BBC website with a screenshot from December 1997. My own memories go further back, to the days when the BBC’s URL was bbcnc.org.uk – and one particular landmark in page design. White with a dark blue left-hand column; some kind of HTML table magic. Groundbreaking in its own small way. I haven’t designed many sites lately which used any kind of conventional left-hand nav; but I have built a few sites which integrated into existing ‘look and feel’ which did still have left-hand nav – and it felt very strange. Blogs and the ‘tab’ metaphor have effectively killed it off. Another interesting trend from the Beeb’s work-in-progress is the overlaying of big headline text on imagery. For an organisation which produces so much imagery, it’s a fairly obvious thing to do: and it may ‘raise the bar’ for other sites with pretensions to similar scale. Pages without pictures are going to look pretty dull in comparison. And it looks like we’re going to see a conscious effort to underline the real-time aspects: I note the various mockups marked ‘ADDED 3 MINS [ago]’. Again, if you’re running a large website and you aren’t demonstrably keeping your core content similarly up-to-date, you’re going to look bad – and risk losing trust. If you want to know what your website will look like in a year or two, have a peek. Do I like it? Yes, yes I do. If you remember the days when, inexplicably, The Scotsman was one of the best online news sources on the planet – that was Stewart. I met him when I spoke at a conference in Edinburgh; he had moved into a small online startup, but was clearly still a news man. And looking back over his blogging in the last year or so, you can see how he’s reached this point: one track extolling the virtues of WordPress (well, usually), the other seeing an opportunity to reinvent the news business. So here it is then, the CalMerc. A fairly straightforward WordPress build, using an off-the-shelf news-y theme – with a bit of customisation, and a healthy dose of plugins. I can see a few rough edges to be smoothed out, and it’s all fairly modest in design terms: but as they told one critical tweeter, ‘behaviour first, design second’. Couldn’t agree more. So Stewart – all the best, big man. If anyone can do it, I’m pretty sure you can. PS: Other WordPress-powered newspapers are available – Bristol 24-7 springs to mind as a similar online startup; the Express & Star came to WP after 120-odd years in print. There may be much more to come if the Press Association has its way.